New revelations have surfaced in a drug scandal case festering at the United States Naval Academy in Annapolis, Maryland, involving a criminal ring of about ten midshipmen, according to Fox News. The United States Naval Criminal Investigative Service (NCIS) was briefed on the illegal activity three months ago when a fellow midshipman contacted authorities about a rogue group of midshipmen selling drugs on campus. 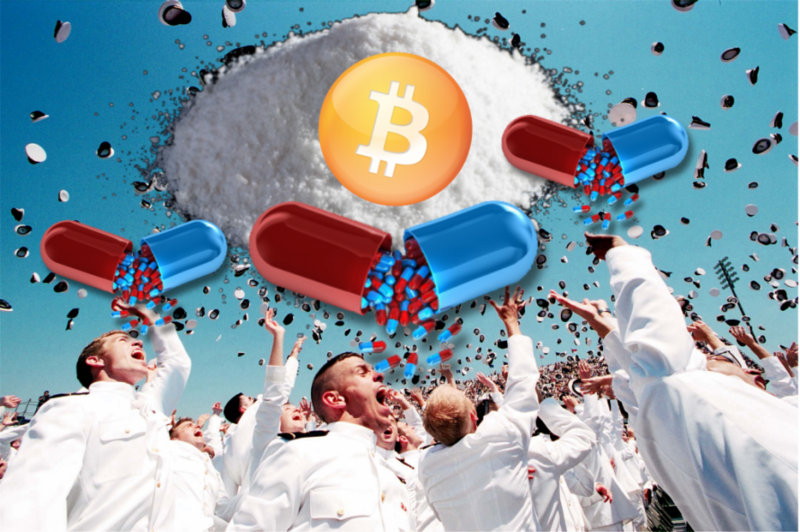 Current reports estimate ten midshipmen were part of the elaborate scheme to supply midshipmen throughout the Naval Academy with powerful drugs including cocaine, lysergic acid diethylamide (LSD), and Ketamine. Fox News specifies the criminal ring used Bitcoins to purchase the drugs on the dark web then distributed the product throughout campus. Sources from within the academy tell Fox News that roughly two-dozen midshipmen are under investigation. No formal or pending charges have been brought against any midshipmen as the investigation expands. Second in command of the school, Capt. Robert B. Chadwick II conducted a surprise drug test for all 4,500 midshipmen at 5:30 a.m. Wednesday morning. Sources tell Fox News that drug tests are only given at the company level with about 150 midshipmen at a time. Chadwick’s response demonstrates that America’s most prestigious military academy has a massive drug problem. Several midshipmen informed Fox News that the investigation is situated around 23rd company of about 150 midshipmen. The midshipmen who provided Fox News spoke on the condition of anonymity because they are not permitted to talk with the media. Fox News has obtained the names of the midshipmen who have tested positive for drugs but says the names will be withheld as the investigation is ongoing. Since charges have not been brought against any of the suspected midshipmen, Fox News is withholding the names of those implicated. Two are prior enlisted midshipmen who had spent time in the fleet before gaining appointment to the Naval Academy, which educates and trains young men and women to become officers in the Navy or Marine Corps. One of the midshipmen tested positive on a drug test in early January after returning from Christmas break, adding more urgency to the investigation, according to one midshipman. Chadwick recently addressed the brigade at lunch, telling them that while the investigation is ongoing, there would be no more discussion about it, according to several midshipmen present that day. “The Naval Academy and the Naval Criminal Investigative Service recently initiated a command-assisted investigation in Annapolis after receiving a midshipman report of alleged recreational drug use within the Brigade,” Cmdr. David Mckinney, a Naval Academy spokesman, told Fox News. “[T]he results of the investigation are still pending. We are continuing to work with NCIS on these reported allegations. The Navy has a zero tolerance for drug abuse and takes all allegations of misconduct very seriously,” he added. Between 2010 and 2011, the Annapolis Capital reported, “NCIS conducted an 11-month investigation into the use of synthetic marijuana, or spice, by midshipmen. That investigation ended the careers of at least 27 midshipmen.” Naval officials have confirmed from 2010 through 2017, seven midshipmen were expelled for drugs. Drugs in the United States Naval Academy should make you furious. It threatens our national security because it lowers the readiness of our midshipmen to become efficient officers. Drugs undermine the authority and strict order that fuels military efficiency. And of course, drugs damage the health of the men and women who are protecting this country. As drugs flourish throughout the military, are we witnessing another crack in the American empire?